FARM KING TEDDERS ARE DESIGNED TO EVENLY SPREAD AND MIX FORAGE TO HELP WITH BALING AND PROCESSING. Farm King Tedders provide higher quality forage and help get crops off your field faster than before. 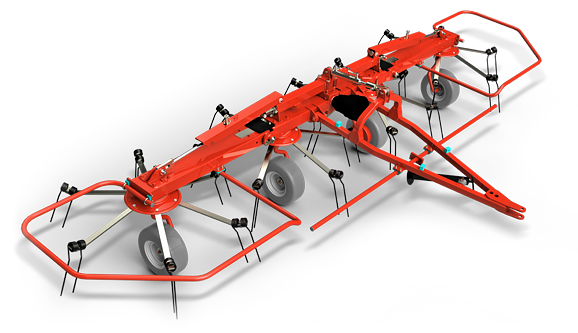 The Farm King RT10 is ideal for smaller field structures, the RT17 and RT19 are better suited for medium farms, and the model RT24 works best for high capacity operations. Farm King offers mounted and pull type tedders for spreading, aerating and turning of forage. Farm King Tedders evenly spread and mix forage so that it is uniformly dried and prepared for baling or processing. Model RT10 is ideal for smaller field structures and features a robust design for low maintenance and long life. High capacity mounted and pull type tedders for even spreading, aerating and turning of forage. Farm King Tedder models RT17, RT19 and RT24 feature hydraulic fold and tilt (tilt optional on model RT17) to quickly change from transport to working position from the cab.